Those are my thighs. Down there. In that picture. Or if you're talking to my co-worker Clemmie, those are my big, pretty thighs. Thanks, Clem. Would you like big, pretty thighs? You can be well on your way to getting them if you whip yourself up a batch of these fire crackers then eat them the whole way from Greenwood to Jackson. I'm not saying I did that, I'm just saying that you could do it if you wanted bigger thighs. No judgement here. While it's not very point friendly, this is a pretty cool snack to have on hand. Like for a march madness party or Easter dinner or something worthy of a celebration. 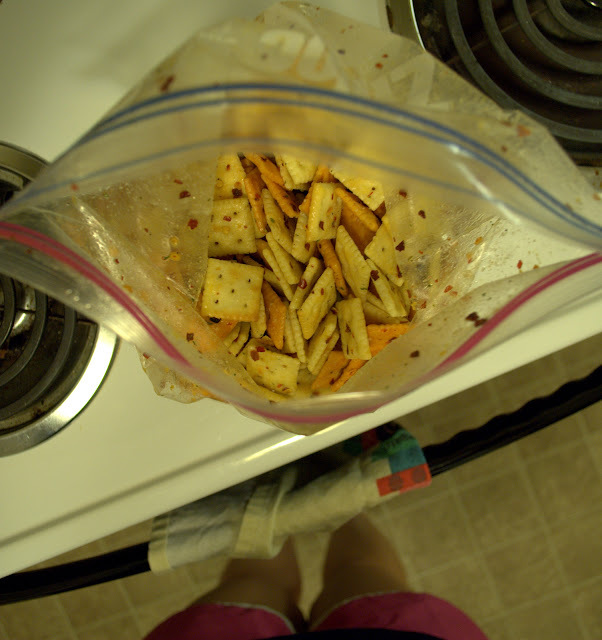 Pour the crackers into a large zip lock bag. Combine the remaining ingredients in a small bowl and stir them well. Pour the mixture atop the crackers. Seal it up tight and toss the bag around to mix. Let it hang out for about an hour, tossing it around about every fifteen minutes to make sure it's good and mixed up. Once the crackers are dry, transfer them to a fresh zip lock bag or some other form of air tight container. Invite all of your friends over and enjoy the magic of the Fire Cracker. Or eat them all by yourself. Again, no judgement here.